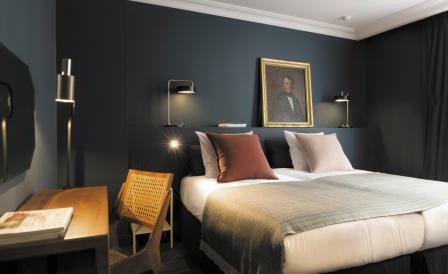 Tucked on a quiet side street near Place d’Italie in Paris’ 13th arrondissement, you’ll find Michel Delloye’s 50-room debut hotel, C.O.Q. An acronym for Community of Quality, the property - which includes a multi-room lounge with a plant-filled conservatory area, a café and a curated shop selling made-in-France souvenirs - was conceived to evoke the spirit of a family home. Designed by local outfit, Agence Favorite, each room is slightly different, but all implore an eclectic-chic aesthetic that mixes contemporary design and vintage accents, with an emphasis on incorporating local French elements such as merino wool D.U.S.T. throw blankets, wood flooring made in Limoges and antiques procured from Paris flea markets. The striking black and white-tiled bathrooms meanwhile, contrast the otherwise texturally rich rooms. A breakfast menu of French specialties is served in the hotel’s light-filled ground floor café, where guests are encouraged to grab a seat in one of the various sitting areas, which transition into a lounge and bar serving regional wines, beer and light bites in the afternoon and evening. A stack of boardgames and a pull-down movie screen in one of the lounge’s cosiest corners suggests that this hotel is not all about business and meetings.